Please complete the form below and your enquiry will be sent directly to Platbos via email. Your enquiry has been sent to Platbos . Platbos, a unique and ancient indigenous forest offers: A Forest Trail for Bird & Tree Enthusiasts. Also: Tented Accommodation, Workshops, Labyrinth, Tree Nursery, the African Tree Essences & the Reforestation Project. Gentle gradients and the leafy forest canopy make this an easy trail for young and old to enjoy. 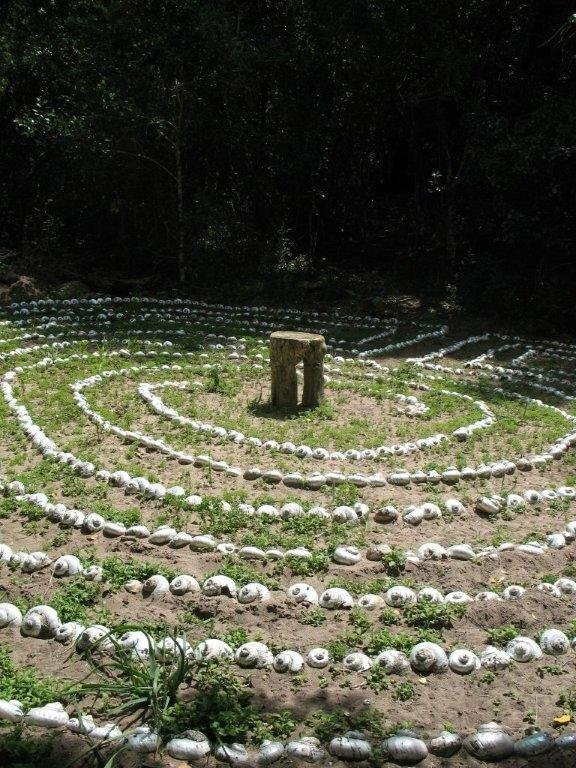 Relax on the wooden benches situated beneath majestic trees along the pathway, or if you are in the mood for quiet contemplation, walk the forest's beautiful labyrinth, made from mother-of-pearl sea shells. Platbos is open both to day visitors and to guests who would like to overnight in either the Old Olive Cabin, the Forest Camp, or the romantic Honey Bee Suite. Pre-booking is required. Visitors to Platbos always comment on its restorative, healing energy. The old and wizened trees, clad in mossy emerald cloaks, also evoke memories of childhood fairy tales - Platbos is a botanical wonderland for the whole family to enjoy. Please help us to preserve and rehabilitate this ancient forest. 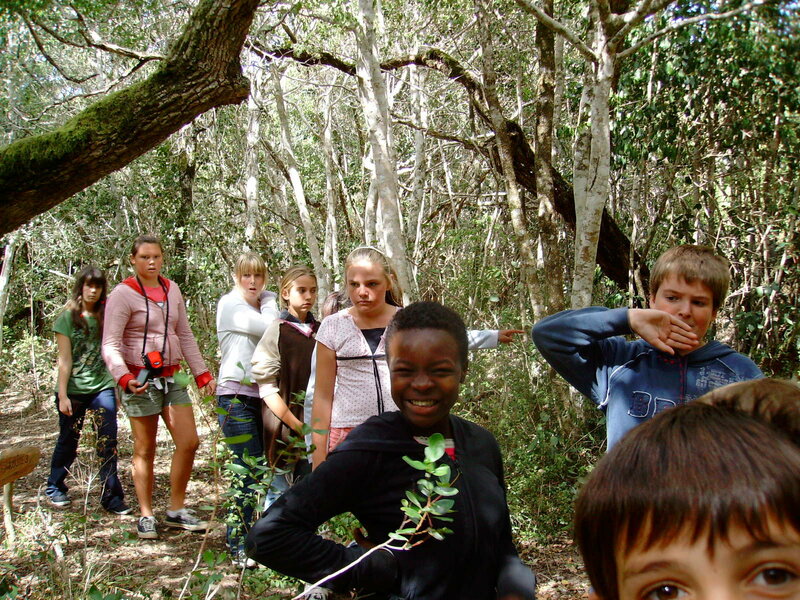 Investigations into indigenous forests and their distribution in the Western Cape, leads to the inescapable conclusion that a combination of climate change over the eons, alien invasive vegetation and fynbos-orientated fire management programmes, have resulted in a situation where natural forests need active intervention in order to survive. 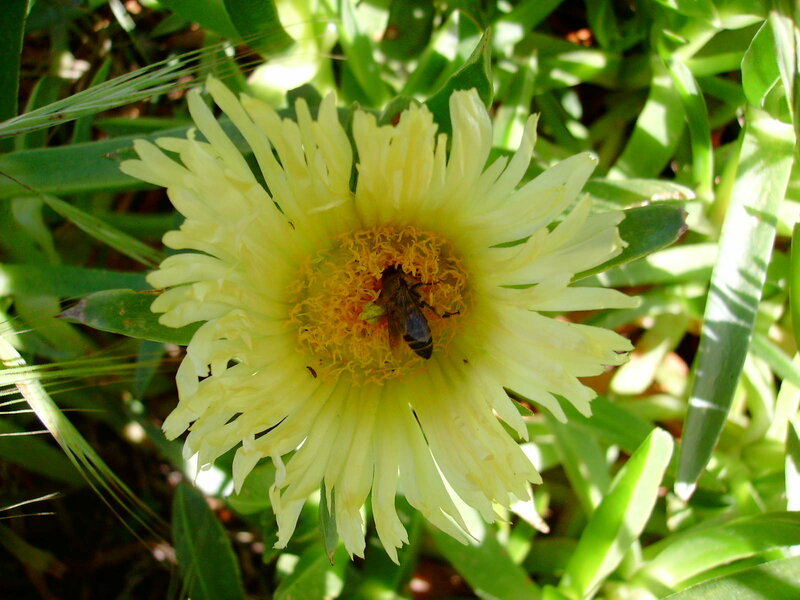 We rely on funding to keep Platbos, a National Forest Treasure, alive. Immerse yourself in the forest: restore your soul and reconnect with the Earth’s rhythms. In the evenings, sit around the camp fire and listen for the owls and the deep bark of the bush buck. At dawn, awaken to birdsong and the sun’s first rays of pink and gold upon the tree trunks. Solar lanterns and candles are provided; please bring along extra flashlights. Wood is provided for the ‘donkey boiler’, extra braai and fire wood may be purchased at Platbos – R20 per bag – please collect from the Reception kiosk and leave your money in the honesty box. No wood may be cut or collected from the indigenous Platbos Forest. Please bring along your own fire-lighters / blitz. Please bring along a Cooler Box and Ice Trays (re-freeze your ice bricks and ice trays in the communal freezer). Platbos Forest is off-grid; this means no electrical plug points or fridge (but as already stated, there is use of the communal freezer). While the water at the cottage is fine for boiling and using in food preparation, you might like to bring along your own drinking water. Please do not use ‘Doom-type’ pesticide sprays, etc, but DO bring along insect repellent during the summer months for mosquitoes. Please respect the peace and tranquility of the forest and keep noise levels down; no loud music, etc. Cellphone receptivity varies in the forest and Vodacom receives better reception. Platbos is a wilderness area; please treat all aspects of it with the utmost respect. We are happy to introduce you to our eco-friendly, off-grid Forest Camp. Offering private, tented accommodation, this forest venue sleeps 4 guests. However, for larger groups, you are welcome to bring along your own extra tents, etc (please see rates for this below). The Forest Camp is exclusive in that guests enjoy the privilege of having this unique and beautiful forest venue all to themselves. Please note: A 50% deposit is required to reserve your booking. Rates per night: R900 for up to 4 guests; thereafter R75 per person. Single Night Stays: By arrangement only; an additional R200 surcharge is applicable. Weekday Special: Mon-Thurs, excluding holidays and public holidays, less R200 per night. In Season (16 Dec – 5 Jan): Minimum of a 3 night stay is required. Check In: Between 2pm and 5pm | Check Out: 10am (unless otherwise arranged). Two tented units with 2 single beds each. All linen, towels and bedding provided (for up to 4 guests). A large tipi tent offers itself as a recreational area: it has a double bed (bring own bedding) and there is space for 3-4 camping mattresses for extra guests who don't want to erect their own tent/s. Fully equipped kitchen with pots, pans, cutlery and crockery. Please note: The Forest Camp provides cutlery and crockery for 6 guests only; parties of over 6 guests must therefore please bring along their own catering requirements. Gas for cooking (note: no oven, microwave or fridge as cabin is off-grid. There is a communal freezer for use at the Reception kiosk). Outdoor fireplace, with braai grid. Hot water fuelled by the old fashioned Donkey Boiler. Great efforts have been made to make this a cut above the traditional ‘long drop’! Situated nearby to one of Platbos Forest’s most ancient trees - a Wild Olive of over 800 years old - the Old Olive Cabin offers you a wonderful opportunity to retreat for a weekend (or more) of peace and tranquillity in this magical forest. Old Olive is the perfect “get away” for couples or a small family of four. Like the Forest Camp and Honey Bee Suite, Old Olive is totally off-grid. The cabin is situated right in the forest, and to minimize impacts to this sensitive environment, the cottage is accessed by a short, beautiful walk through the forest. Rates per night: R700 for 1-2 guests; R800 for 3 guests; R900 for 4 guests. Discount: Available on stays of 5 nights or more. Guests staying at the Old Olive Cabin may walk the forest trail free of charge. Open plan kitchen/sitting room with a sleeper couch that folds out into a double bed (duvet, pillows provided). Fully equipped kitchen with pots, pans, cutlery and crockery. Double gas plate for cooking (note: no oven, microwave or fridge as cabin is off-grid. There is a communal freezer for use at the Reception kiosk.). Indoor and outdoor fireplace, braai grid provided. All linen, towels and bedding provided. Looking out onto a stately white stinkwood tree, this hot water shower is a magical experience all of its own. Wonderful views into the forest. We are happy to introduce you to our eco-friendly, off-grid Honey Bee Suite. Offering private, tented accommodation, this forest venue sleeps 2 guests. However, for larger groups, you are welcome to bring along your own extra tents, etc (please see rates for this below). The Honey Bee is exclusive in that guests enjoy the privilege of having this unique and beautiful forest venue all to themselves. Rates per night: R700 for up to 2 guests; thereafter R75 per person. Guests staying at the Honey Bee Suite may walk the Platbos Forest trail free of charge. Double bed with mosquito net. The walls of the bedroom are canvas blinds that can be rolled up as desired. Please Note: The Honey Bee Camp provides cutlery and crockery for 2 guests only; parties of over 2 guests must therefore please bring along their own catering requirements. Gas for cooking (note: no oven, microwave or fridge as camp is off-grid. There is a communal freezer for use at the Reception kiosk).